A Buffalo in Grand Theft Auto: San Andreas. 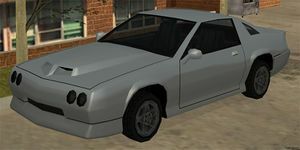 The Buffalo is a muscle car which appears in different forms in Grand Theft Auto: San Andreas, The Ballad of Gay Tony, and Grand Theft Auto V.
The Buffalo in GTA San Andreas appears to based on the third-generation Chevrolet Camaro. Even though it is clearly based on a 1982-1992 Camaro, it has been changed quite a bit. The headlights are circular, coincidentally similar to a 1994-2001 Acura Integra; a C-pillar has been added, bearing somewhat of a resemblance to 1984–1993 Dodge Daytonas; and the shape taillights look closer to some third-generation Pontiac Firebird models. The Buffalo also has a ram air hood, and, surprisingly, handles well off-road. In GTA IV and its episodic packs, the Bravado Buffalo is a four-door sports sedan based on the 2006—2010 Dodge Charger with its front end bearing subtle similarities to a 2005–2009 Ford Mustang. When GTA IV was originally released, the game's rendition of the Buffalo had not been made available as a consumer model, despite numerous billboards advertising the car in Liberty City (most prominently at the end of the Dukes Boulevard Station line in Steinway, Dukes). Rather, the vehicle is initially depicted as a law enforcement vehicle for the Federal Investigation Bureau, dubbed the FIB Buffalo. The retail model is featured as an added vehicle in The Ballad of Gay Tony, the second downloadable episode for GTA IV. The Buffalo is briefly seen in the GTA V first trailer, and seems identical to its appearance in GTA IV. A sportier variant, dubbed the "Buffalo S", is also available in GTA V, although the game's HUD does not differentiate between the two. The Buffalo S is based on a 2011-2014 Dodge Charger. The Buffalo S also has a variant named the Buffalo Sprunk, with a Sprunk livery. The law enforcement model is taken from the base model of the Police Package Charger as it is powered by a V6 engine, similar to the Police Patrol. Both variants have a stock body kit and plain black wheels with chrome centercaps. The FIB variant is only available in black and features 2 sets of emergency lights mounted on its grille and rear windshield whereas the LCPD variant has similar equipment to its Declasse and Vapid-branded counterparts. In The Ballad of Gay Tony, the Buffalo's consumer model features a performance body kit that includes larger exhaust ports, sport rims (similar in design to those found the the Ubermacht Rebla), bumpers, and side skirts, suggesting that it is based on the Charger's SRT-8 model; however, the Buffalo lacks the rear spoiler and hood scoop found on the SRT-8 model. While absent in GTA IV, a billboard advertises the consumer model of the Buffalo. On closer inspection, the pictured Buffalo features grill-mounted lights from an FIB Buffalo. The badge is also shown as being much larger and mounted on the grille, while in actuality being mounted on the hood. Upon further inspection, the headlights appear to represent the horns shown on the Bravado badge, while being at a less steep angle. A Buffalo in The Ballad of Gay Tony (Rear quarter view). The Buffalo in the Franklin trailer for Grand Theft Auto V.
A Buffalo in Grand Theft Auto V (Rear quarter view). A Buffalo S in Grand Theft Auto V (Rear quarter view). The Buffalo S owned by Franklin Clinton in Grand Theft Auto V.
A Buffalo Sprunk in Grand Theft Auto V.
The Buffalo's raw performance in TBOGT is considerably good for a four-door sedan, courtesy of its high displacement supercharged V8 engine, and may even be superior to its law enforcement variants. As expected, the car is capable of good acceleration and a decent top speed of 199 mph (320 km/h), but is also lighter than the law enforcement Buffalo's, allowing the car to corner and brake better. While the car is still prone to burnouts after certain moments of cornering, the car grip on the road is equally excellent. Another minor quirk is its tendency to ignite unburnt fuel at the exhaust pipes during throttle liftoff after high revving, a common quirk with the Banshee and the Sultan RS. Due to it being a front-engined car, the Buffalo is highly vulnerable to frontal and engine damage, but can withstand rear damage. The GTA V rendition of the Buffalo has virtually identical performance to the Buffalo in The Ballad of Gay Tony. San Juan Sounds in The Ballad of Gay Tony. In GTA IV, the Buffalo shown in billboards has a large Bravado logo within its grille, unlike the FIB Buffalo or the civilian Buffalo which have a small logo above the grille. Interestingly, the billboard Buffalo also retains the police lights found on the FIB variant. It is believed that Gay Tony's boyfriend, Evan Moss, drives a Buffalo in The Ballad of Gay Tony, as it is seen in the opening cutscene of "Bang Bang" while Evan is at Tony's loft, and in the beginning of the mission, the player has a choice between driving the Buffalo or Tony's Schafter. Mori Kibbutz is implied in several missions in the Ballad of Gay Tony to own a unique bright red Buffalo. Rather than having a similar engine noise as the FIB Buffalo, the Buffalo in The Ballad of Gay Tony has the same engine sound as the Police Stinger, but does not accelerate or drive as fast as the Stinger. The Buffalo also has a very similar horn to the Brickade. The Buffalo may appear in the Drug Wars in The Ballad of Gay Tony as a vehicle for drug escorts, and may have unique body colors. A black Buffalo may also be found be parked near the jetty where the player lands any drug helicopter that they must steal during certain Drug Wars. If the player takes a Buffalo in The Ballad of Gay Tony to a Paint 'n' Spray too many times it will turn a unique, dark brown colour. This colour will then be permanent, and no amount of subsequent resprays will change it. This is most likely a glitch, as almost every other car in the game will continually cycle through its available colours each time you visit a Pay N' Spray. The exceptions are the Dukes, the Infernus, and the PMP 600, which all suffer from similar glitches. Compared to the FIB Buffalo, the TBOGT Buffalo appears considerably smaller than its government counterpart, with it being slightly narrower. Spawns while driving a Perennial in Santa Maria Beach, Los Santos (Friday). Beside Catalina's Hideout at Fern Ridge, Red County. Spawns while driving a ZR-350 in Queens, San Fierro (Saturday). In traffic at Juniper Hill, San Fierro and usually around The Strip in Las Venturas. Parked at the Xoomer gas station in Easter Basin, San Fierro, when wanted for Exports and Imports. May occasionally come equipped with an alarm. Available to import for $28,000 at the Import/Export dock in Easter Basin, San Fierro after delivering the car. In "Misappropriation", if the agent reaches The Emerald Isle, he will land on the helipad and run down to the parking lot, where there is a silver Buffalo that is bullet-, fire-, explosion- and damageproof. It will be locked unless the player takes it to a safehouse garage. A video demonstrates how to obtain it. A unique white Buffalo with a license plate reading "PULASKI" is driven by Eddie Pulaski in "High Noon". If the player destroys it during the mission, it re-appears when they get the "Mission Passed!" message. If the player is hijacking a boat during the Drug Wars he will be required to bring it to the docks in the northernmost part of Algonquin (in Northwood). The Buffalo will be right in front of the player after he delivers the boat and he is at the top of the stairs. It is also found there when you have to steal a helicopter and bring it to the same location. It can mostly be found anywhere as it is a common car, but it is most common in Algonquin and Alderney. A phone call to Henrique. A unique red Buffalo belonging to Mori Kibbutz can be obtained during the course of the race in This Ain't Checkers if it is chosen for the driving portion of the competition. This Buffalo is equipped with nitrous oxide boost for the duration of the race, but this is disabled after the mission ends. Ruiner, a similar car in the HD Universe that fills the 1980s muscle car slot of the GTA San Andreas Buffalo. This page was last modified on 30 June 2015, at 19:49.